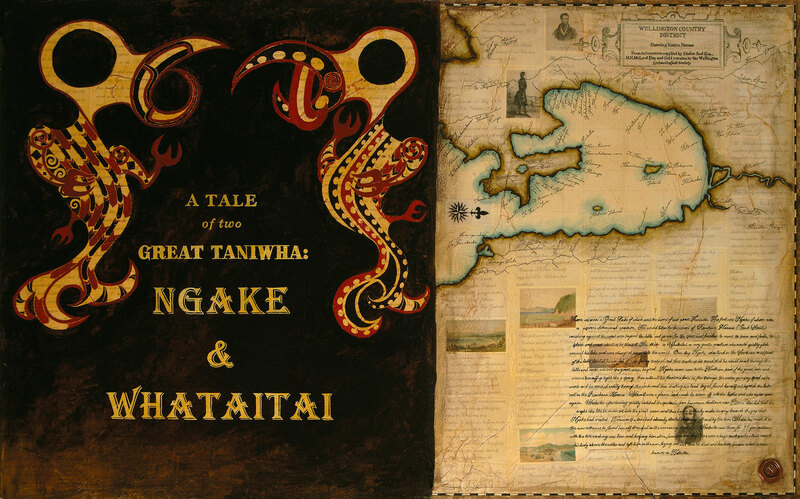 There was once a great lake of which was the home of two great Taniwha. Ngake and Whataitai. Ngake felt trapped and decided to break through the hills and rocks out into the great ocean. Ngake swam over to the Northern part and wound himself up tight like a spring, then with all his force flew through the water gaining speed as he went until he crashed wildly through the rocks and found himself beyond the lake in the Raukawa Moana. He swam off and was never seen again. Whataitai decided to swim out into the great ocean as well and began to make his way towards the gap the Ngake created. The lake had already started draining off and by the time Whataitai made it to the new entrance he was stranded. Whataitai was there for generations. An earthquake raised his body above the water and left him in the sun drying out. His body became known as Hataitai. This story is on the painting twice. 1st Behind the images of Ngake & Whataitai on the left. 2nd Handwritten script on the right.